3.1. Is WordPress Good for a Website? 3.2. How Do I Set Up a Website for my Small Business? 3.3. How Do I Build a Website Using WordPress? 3.4. Can Anyone Use WordPress? 3.5. Can you use WordPress for Free? 3.6. How Much Does it Cost for a WordPress Website? 3.7. What is the Difference Between WordPress.com and WordPress.org? Who does not like useful things free of cost? Everyone want such kind of things for which you don’t have to pay. This is the one main reason to choose WordPress. You can download this software and use it for absolutely free. One of the reason Why WordPress is the best platform is that it is open-source which means that you have open access to use WordPress. However, that does not mean that your website will be at risk. WordPress has provided the proper security to its users. However, you can build code for free through WordPress. Complicated tasks or things often irritates people. People mostly go for those which are easy going and smooth. So is the case with WordPress. It does not need any rocket science to run. WordPress is easy, simple and smooth software to use. Living in an era where everything is viewed on a small screen ho wouldn’t want their website to be responsive or mobile-friendly? Count on WordPress and here you go. WordPress makes your website mobile-friendly so that your customers can view your site on any screen which in turn will have a great impact on your customers. As mentioned above, WordPress is simple and easy to use software and because of this, it is very easy to manage. WordPress has provided different tools through which you can manage your posts easily. Every site owner wants to rank high on search engines. WordPress has the potential to make this dream come true for them because the search engine giant Google prioritizes WordPress websites. By using WordPress, you can enhance your rank in the search engine. Hacking, spamming is common nowadays. You must have to keep an eye around in order to be safe. Good news is that WordPress has given you relief from this huge responsibility. WordPress keeps hackers away from your site giving you the best protection through updates so that your data may not be robbed by other sites. The visualization of a website can have a great impact on the customers. WordPress provides an extensive series of themes for their users. You can choose any of your choices either free or by paying them a bit. WordPress provides a wide range of both free and paid plugins for their users. In order to enhance your user experience, you can select any plugin from here to add more features to your website. WordPress has made customization easy by providing different features. You can customize your website as you want whether in look, content or anything. WordPress has provided simple and easy tools through which you can have your desired thing. One of the other reason why you should choose WordPress is its flexibility and adaptability. You can do anything you want with it. You can customize your pages, themes, manage your content, plugins and many more things with this software. 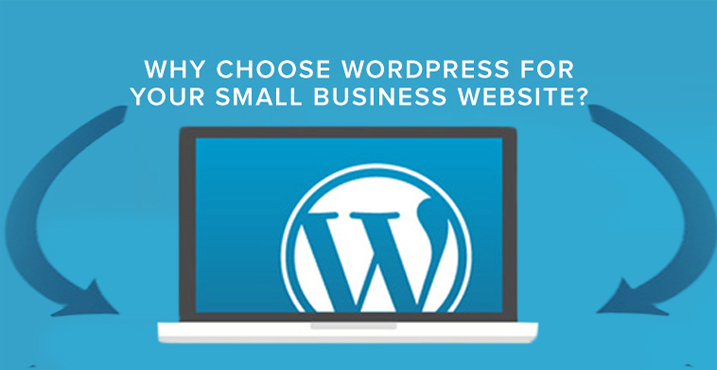 However, you can use WordPress for your small business website, an e-commerce website or either for a personal blog. WordPress is a bumper package you can say. WordPress provides its users an open ease to upload any media. You can add text, images, audios, videos or whatever you want to upload to your website. You have full access to it. WordPress provides its user the advantage of constant updates. The team of WordPress is consistent in fixing every issue of this software. It constantly keeps its users up to date with the latest web building technology which is highly important for maintaining the security of the website. If you want to set up your online store then WordPress is the platform to go. 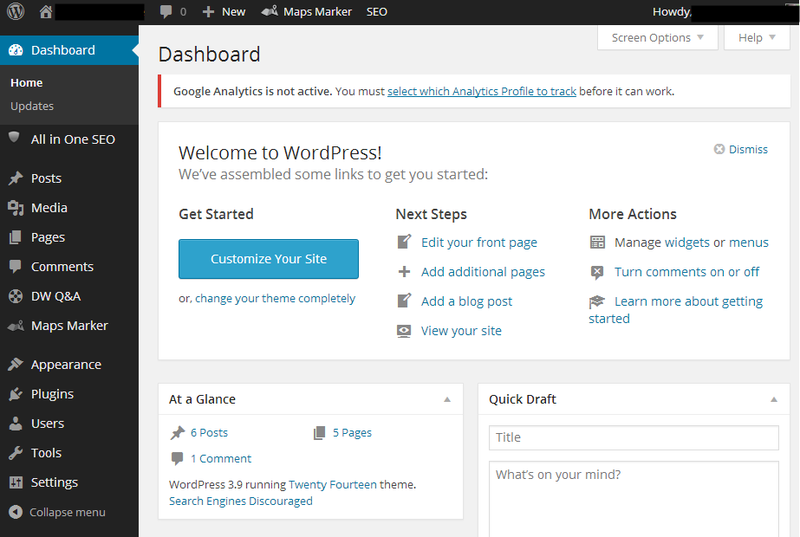 WordPress has a lot of tools, plugins, services etc. that will be very essential for running your online store. Why wait then? WordPress also provides its users the facility of social media integration. With this, people can reach out to you through their social media accounts of Facebook, Twitter etc. They can comment on your posts giving you their own viewpoint and can interact with you. However, with social media integration, your website is exposed to a more expanded platform. Providing post scheduling facility is another reason why to choose WordPress. With WordPress, you can write your content and schedule them. It means if you want to posts your things or content at specific times then WordPress is the way to avail this opportunity. It has made the publishing of thing lot easier. If you have the WordPress application on your handy device, then there’s no worry for content publishing. You can publish your content anywhere anytime from your mobile or tablet if it contains the WordPress app in it. It is that much feasible. If you are not a native English speaker, then you don’t have to worry about that. WordPress has availed you this solution. You can translate WordPress into almost 170 different languages using their plugins like Polylang, WPML or qTranslate X.
WordPress is not only the most popular but also the most preferable Content Management System (CMS) in the digital world. 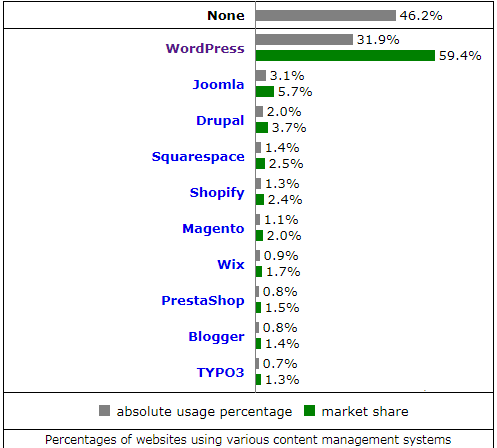 According to W3Techs, WordPress is the most used CMS platform. 59.4% of all the websites are using this software. The answer to this question is simply yes! People often think WordPress is just a platform for blogging which is not true. However, that used to be true back then but not in the present. With the changing time, WordPress has made progression and has transformed itself from a Blogging Platform into a dominant Content Management System (CMS). How Do I Set Up a Website for My Small Business? The first step is to decide the name of your business website, also termed as the domain name (e.g. yourwebsitename.com), and then go for the registration process. But remember you should not have to choose that name of your website which is already in the market. To find out the availability of your website, there are different platforms like NameCheap, GoDaddy or Bluehost. Type your domain name in their search bars and just check it out! But prefer to make domain name short and easy so that it is remembered and pronounced easily. After choosing the domain name, now it is time for you to choose the right platform and host for your website. You can choose any platform which you find suitable for you like Bluehost, NameCheap, GoDaddy and many more. Bluehost is the number 1 and the most versatile web hosting platform. You can create, register and host your website here. However, its pricing packages are high as compare to other hosting platforms as it gives the most valued hosting to their customers. Bluehost provides different types of hosting and domain services like shared hosting, WordPress hosting, VPS hosting, Cloud hosting etc. NameCheap is a domain registrar and a hosting option which provides the cheap pricing to their customers. NameCheap offers the high quality hosting products at the most reasonable prices. It is easy to manage and is user-friendly. However, Namecheap is among the top 10 hosting platforms globally. GoDaddy is also a domain registrar as well as a web hosting platform dedicated to small ventures. It provides the affordable web hosting but there has been some ad user experience related to web hosting of their customers. The next step is the listing of your website content. The content list shows what your company wants to say. It should be simple and concise. Basically, there are four pages of the website: Homepage, Products, and Services page, “About us” page and the Contact us page. On the homepage, the name of your company, a little description of what makes your company unique and why one should choose this, might be included. The products and services page of your website showcase the services and products that the company is offering. The “About us” page gives a thorough description of your company. On the other hand, the Contact us page gives the contact information for reaching out to you. After outlining your website content, the next thing is to design your company’s logo. The company’s logos have a great impact on their customers. The font style, color etc. affect your website design. It might have the potential to attract or distract your customers. It’s perfect if you already have your logo. If not, then you can create it by yourself or you can hire professionals to make it for you. If you want to make your logo by yourself then there are plenty of software that allows you to create your company’s logo. One of which is Tailor Brands. You can easily create your stunning logo by trying out this software for free. However, you can then subscribe and get access to their branding tools. If you like any design from them you can download it by paying an affordable amount of money. If you don’t have the skills of designing your own company’s logo then you can count on the professionals. Coding Pixel is here to provide you with the service. However, you will have to pay a little to them for the designing. The last but not the least but one of the most important step is the designing of your website. Once you have done all the above mentioned things for your small business, then it is the time to compile up the above things and give it a look. The design makes the customer decide whether to stay or leave the website so it needs to be carefully designed. How Do I Build a Website using WordPress? Install WordPress to your domain firstly. There are two ways to install WordPress. Make a new folder on the desktop. Then unzip WordPress in this folder. After, filling the required information, save the file now. Now you have to log in to your hosting FTP for which you have to download FileZilla first. File Transfer Protocol (FTP) address normally appear as yourdomainname.com. However, username and password will be the same that you used for registering to your host. Upload all your files from the WordPress folder to your FTP server. Just fill out the gaps, click on Install WordPress and you are done. Now you are on the dashboard which means you have access to various free themes. Click on the “Appearance” in the sidebar, then click on “Themes” and here you go. Browse in the themes of your choice, select which you like most and click on install now button. Installed? Click the activate button. Tadaa! You can change your theme whenever you want but that doesn’t mean it will remove your previous data. So, go easily! If you want to add any page like “About us” or “Products and Services”, click on the “Pages” button in the sidebar of the dashboard and then click on “Add new”. A screen, just like Microsoft Word page, will appear. You can add text, images or whatever you want just like the way you add in MS Word and then save it. 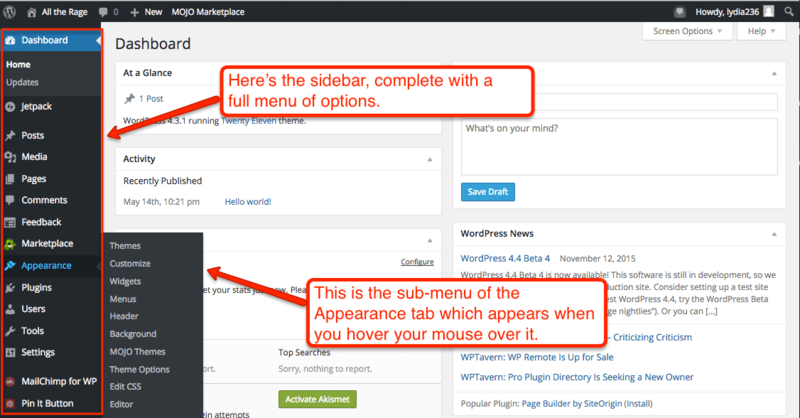 If you want your page to be linked to the menu then click on the “Appearance” button, then click on “Menus” in the sidebar of the WordPress Dashboard, now search the page you have created, click on the checkbox of that page which you want to link with your navigation bar and then click on the “Add to Menu” button below. If you want to create categories of your posts, click on the “Posts” button in the sidebar and then to “Categories” button. Here you can create different categories of your posts by giving names. On the other hand, if you want to create a blog post then, go to “Posts” and click on “Add New”. Now just add the suitable category for it. Through WordPress, you can customize and modify anything you want. If you want to change your page title or tagline then go to “Settings” in the sidebar, click on the “General” button and go ahead to make changes. You can also restrict your visitor’s comments on your site. Just go to “Settings”, click on “Discussion” and then untick the “Allow people to comment” button. WordPress is plenty of free plugins. Basically, plugins add more features and functions to your website. To install plugins from WordPress, click on the “Plugins” button, then to “Add New” and search the plugin which you want to install. After finding the required plugin just click on “Install” and here you go. WordPress is the most used and the most popular open-source Content Management System (CMS). It is used to create any kind of website. Anyone can get access to it. Can you use WordPress for free? Yes, WordPress is a free software. You can download, install and use WordPress for free. How much does it cost for a WordPress website? WordPress.com is a hosted service. 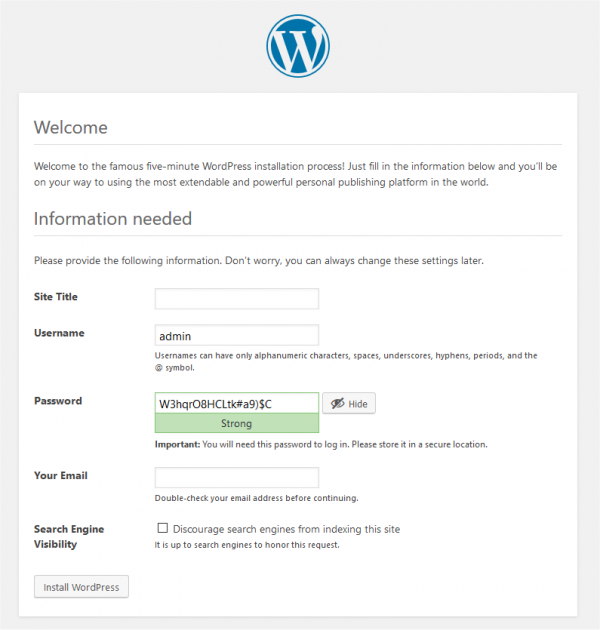 WordPress is already installed in it, you don’t need to install WordPress by yourself. WordPress.org is self-hosted. To use the WordPress software at WordPress.org, you yourself have to install it on your web server. On WordPress.com, you just have to sign up for an account to create a website. Creating a website with WordPress.org can be a bit tricky. You have to go through a series of steps to build a website. WordPress.com provides you full security from hacking, spamming, updates, backups etc. You just have to focus on your site rest is the duty of WordPress.com. With WordPress.org, the responsibility of your company’s security is solely dependent on you. You must have an eye on all these things like spamming, hacking, backups etc. In WordPress.com, you cannot upload your plugins and themes. You only have to choose from the given list of plugins and themes. Apart from this, you don’t have access to your database files and backend codes. With WordPress.org, there’s no restriction. You can upload your own plugins and themes which you want. However, you have access on all your database files as well as to the backend codes. WordPress put forth immense flexibility for their users. After having the proper knowledge of its benefits, one must not resist using WordPress. It is simply easy and useful. Whether it is a company website, e-commerce website or a personal blog, WordPress is the best way to get started with web development. If you are looking for a web developer and designer, then Coding Pixel, in no way provides you the best web designers and developers. Coding Pixel is a software development company dedicated to promoting their customer’s business. Reach out to us at info@codingpixel.com. You can also contact us at 832-699-0088.